Pacific Northwest region east to Idaho and Montana. Also found in Arizona, California and Wyoming. Moist, moderately well drained to well drained slopes. Use 10 x 20" flats with 3 part fine sphagnum, 3 part horticultural perlite and 1 part #4 washed sand. Luna, Tara; Wick, Dale; Evans, Jeff. 2001. Propagation protocol for vegetative production of container Phyllodoce empetriformis (SW.) D. Don plants (800 ml containers); Glacier National Park, West Glacier, Montana. In: Native Plant Network. 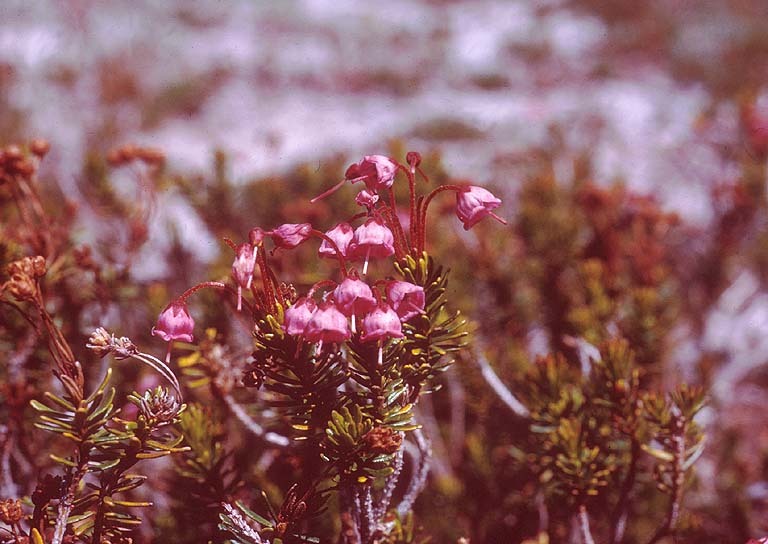 URL: http://www.nativeplantnetwork.org (accessed 21 April 2003). Moscow (ID): University of Idaho, College of Natural Resources, Forest Research Nursery. Potash, Laura and Carol Aubry. 1997 Mt Baker Snoqualmie National Forest Native Plant Notebook, 2nd Ed. North Cascades Institute, Sedro Wooly, WA. 412 p.